Insurance Journal reported Monday that the Google Compare auto insurance site will suspend operations — possibly for good. Strangely, Google will not only halt the pilot U.S. version but also the popular, established United Kingdom version, according to a source for the magazine. CoverHound.com President and CEO Keith Moore told Insurance Journal that Google would “go dark” to revamp consumer product sites; the search engine company was also pulling other financial product comparison sites, Compare.com CEO Andrew Rose told the magazine. The service might have hit its high-water mark in the U.S. in June, when No. 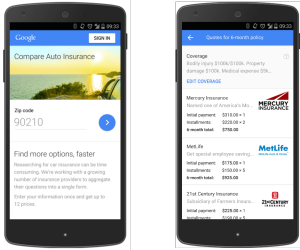 5 auto insurer USAA signed up to provide quotes through Google Compare. Until then, the only Top 10 insurer presence was No. 6 Farmers, No. 8 Nationwide and No. 9 American Family — but only through subsidiaries Foremost, Titan and the General. Risk Information editor Brian Sullivan told Insurance Journal Google Compare had expanded slower than Google anticipated, possibly because they misjudged how complicated auto insurance can be. ITC President Laird Rixford pointed out that a price comparison site would hurt Google’s pay-per-click business model, according to Insurance Journal. For repairers, the end/pause of Google Compare might be good news. Purely price-driven insurance shopping might cause customers to drop or omit collision or catastrophic coverage — or get a deductible so high that they effectively can’t afford to pay enough to reach the point where an insurer would pick up the rest. That all could mean less collision repair work. Fewer people will claim when they have a collision because they suddenly realize that they have a $1,500 deductible, and it’s unaffordable. This means fewer repairs being carried out. The smaller, more profitable work is being taken away, and the statistics we witness show annual claims percentages down in about five years from 14 percent to just 8 percent—almost half of the work being repaired under the (direct repair program) model. Sixty-five percent of insurance was bought through these sites in the U.K., Parker wrote in April 2014, and premiums fell 40 percent. That hits the wallet of the insurers, which respond. “This typically means significant internal staff culling and, inevitably, a squeeze on the supply chain—that’s you,” Parker wrote.